Gardening wish lists. Some are written down. Some are mental. Some are dreams that I'll never actually fulfill due to zone boundaries. It's fair to say no matter which list an item falls under, I'm always on the lookout for it wherever I go. Is that true for all gardeners? Is that list ever complete or satisfied? With each one I cross off the list ---it seems a couple more are added in its place. Such is the gardening life I've found and I'm okay with it. There are a few specific plants (hmmm, aren't they all?) I've had on my wish list since last summer. I've managed to cross off many of them and have found comfy homes for them in my garden. Most of the time it isn't a matter of finding a home for them, there is usually a home prepared for them while waiting for their adoption. Hubby and I took a road trip to visit our youngest son and his wife in Tallahassee, FL. this past weekend. The guys had an early tee time and an FSU spring football game to attend on Saturday together. What in the world were the girls going to do with a full day of girl-time on our hands? Shopping is a good idea! It wasn't the mall for us. We picked out two garden centers we would spend hours browsing through together. One was further north and one was further south of their home. To my sheer delight my DIL has been bitten with the gardening bug. She likes to chat about plants and gardening without end just like I do. Well, now that I think about it---maybe that was ME talking her ear off. Sorry, E.
Her planting medium is compacted red clay and she lives 300 miles north of me in a cooler zone 8. I give her huge props for all she's learned and accomplished in the two spring seasons they've occupied their adorable cottage style home. With lots of soil amendment and hard work she's turned their charming garden into an array of flowering shades of pinks, whites and purples. 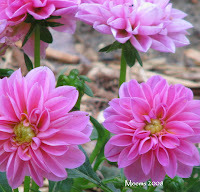 Some of her garden is featured in the above photos. Her knockout roses are doing well after a severe post-winter pruning. 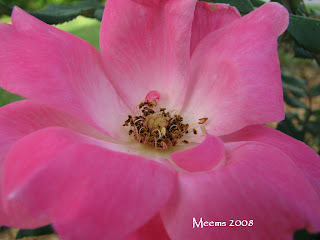 Roses are a favorite of hers that she'll add to as her garden grows. She's got climbing roses on her wish list. 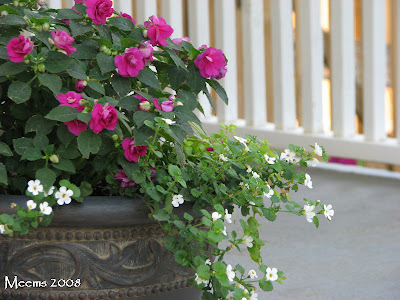 Then there is the container garden that bedecks her front porch greeting those who enter with its cheery blooms. 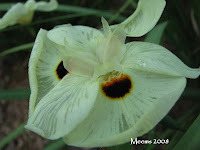 The perennial yellow african iris was the builder's choice. They've kept them at the corner of the front porch for its low-maintenance feathery green addition to the landscape. My favorites were the amazon dianthus she planted this spring with their plump rounded heads made up of oh so many deep fuchsia pink flowers... they are the centerpiece of one bed standing tall at 2-3 feet. 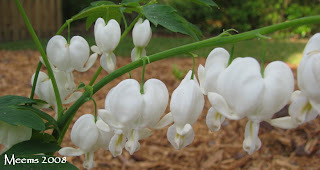 The white bleeding heart is blooming nicely, too. As soon as we pulled into the parking lot of Tallahassee Nurseries I found myself surprisingly awe struck. It occured to me I'd never been to a garden center this large or this well supplied and organized. Now keep in mind, I'm the one from the big metropolis and we don't have anything like this where I live. I was like a kid in a candy store. My first feelings were that I didn't know where to start or how to take it all in at first. 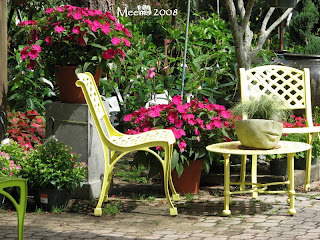 It was so nicely laid out with paved walkways, seating areas, and orderly sections of every imaginable shrub, perennial, annual, seed packet, container, statues, benches, bird baths, rocks, stones, and general garden supplies. I decided right then and there it's a very good thing for my pocket book that I live 300 miles away and only visit occasionally. Butterflies are guaranteed to add to the joy of any garden center experience. They will be fluttering around in spite of all the people activity. 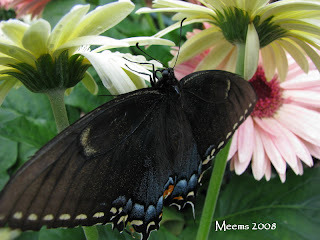 This one is a black swallowtail my DIL spotted for my camera to capture. I didn't forget I was originally talking about fulfilling some of the items on my wish list. I found 3- gallon oakleaf hydrangea and bought two of them. There aren't many hydrangea that will grow in my zone. I guess that's why they are hard to find in my own neighborhood. Even the oakleaf will be a stretch for this zone but I'm willing to give it a go and take the risk... I really, really would like to find it successful at hoe and shovel. After a couple of hours of sauntering and ooohing and aaahhhing that flew by quickly, we made our purchases, took a lunch break and then headed to our second garden center. This one called "Just Fruits and Exotics". It was much smaller and licated in a very rural small town south of Tallahassee. This one was just as exciting for different reasons. As soon as we stepped out of the car at this center we were greeted with the heady scent of wisteria. This one's blooms dripping from a pergola and its sweetness wafting through the air on the soft breezes a cool front was bringing through the area. Here I found some midnight and illustris taro (elephant ears) I'd been wishing for and only had found online for outrageous prices. 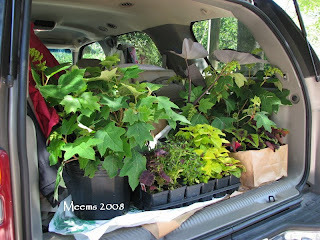 In addition, I bought several varieties of coleus I've been longing for at reasonable cost- again not found in my area. My DIL bought a variegated weigela with blush-pink blooms and indian jasmine that promises to bloom practically all year long. 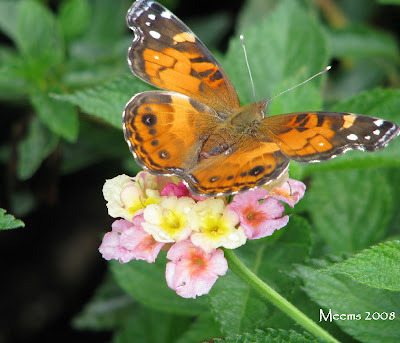 This time it was an American Painted Ladies butterfly that caught my attention feeling right at home posing for me on the pink and yellow lantana. I went to sleep that night designing in my head and imagining where my new purchases would go in my garden. It's real important when shopping for plants out of town to have enough room in the vehicle to get them back home. It was a close call but once I fit all the plants in I managed to pile the rest of our belongings in the back seat. I'm getting pretty adept at this out-of-town-shopping-at-the-garden-center thing. It's almost like acquiring a passalong. Everytime I come across these plants in my garden I'll remember that wonderful day spent with loved ones and those especially good finds from a special time and place. I guess it's a good thing I'm on the other coast...those nurseries looks wonderful! I felt that little 'oh boy' feeling I get when I pull into the parking lot of a beautiful nursery. What fun to have a fellow gardener in the family! It sounds like a wonderful outing. :) And the plants you chose are proven winners. Sounds like a fun excursion! I drive all over and check out all of the area nurseries. I even stop at any garden center I see when I'm on a trip. Even if I don't have the room or the money to buy anything. It's hard, but I love the variety! 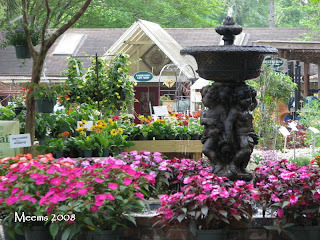 A whole day of shopping at plant nurseries sounds like heaven! We've got about another month until they start to set up the greenhouses here...it's coming fast! I'd better get digging - I've got some new beds to make. Meems, how nice you and your daughter-in-law have a love of gardening in common. Those garden centers look wonderful. We don't have anything like them around here. It's probably for the best! I could go nuts in a place like that, then I'd have to figure out how to get it all home, since my vehicle is small. That's probably for the best too! great treat! 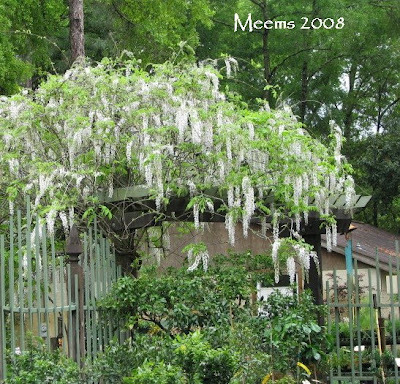 I too would love to grow wisteria. My other two are tulips and lily of the valley. Take care! What a grand and glorious day! I get in that situation and I can't stop taking photos. I want a limelight hydrangea. I'm so happy for you. Looks like ya'll loaded up. Ummm-let's see. Maybe not enough room for the plants-what's to go? I've threatened leaving my son but then, luckily, we fit them all in the car. Yup, gotta take a big enough vehicle to get all those beautiful purchases home. Good luck with the oakleafs. leslie, I am still today reviewing in my mind the greatness of those nurseries.Every area was well marked and every grouping of plants well tagged with descriptions and habits. It was great fun and very relaxing. Dee: It is thrilling to share my love for gardening with my DIL even though we don't live in the same town. It gives me great joy to see/talk about what she's planting when we visit. Cinj: You are right... it is really fun just to see the variety and the different ways garden centers manage their merchandise and what they carry. amy: I felt the same way. I don't remember ever doing that before (spending a whole day going to garden centers)now that you mention it. When I'm home I always have a project in mind and stick to business as usual. Hey- you've got some rocks to move around don't you? garden girl: I didn't include it in my post but there was a rain shower that trapped us in the covered gardening supply center for a while. We both purchased a few doo-dads from there and if we weren't so hungry could have stayed at that first garden center for another 2 hours... it was THAT big. Anna: I took so many photos I didn't upload to the blog. It was easy to be snap-happy with all the eye-candy available. Tina: Well, that was kind of the big laugh with hubby... let's see... you might have to strap your golf clubs to the luggage rack on top of the truck, honey... will that be a problem for you? I'm so glad y'all didn't get rained out! I was just telling DS the other day, I can't believe we've never been to Tally Nurseries. Now I'll have to plan a run up there for sure. And I'm way overdue for a Just Fruits visit. That wisteria is breathtaking! It's one of my top ten favourites, even though the Chinese variety is frowned upon as a nasty invasive. sophie: I'm glad you mentioned the invasive habit of the Chinese Wisteria- I forgot about that but it mentions that fact in the link I gave to ldybug and then references the other variety that is more recommended which I can't remember right now. I LOVE Floridata and actually just got some Hurrican Bulbs (yesterday in the mail) from Steve (from the ask Steve section) who lives in Quincy, FL. He apparently harvests them from his own yard. I didn't realize Jack's place was in Woodville... I wonder if he does tours... that would be something! Oh Meems, the photos in this post were just spectacular. Then you left us at the end with that thrilling shot of your loaded SUV. AACCCKKK I need a shopping spree! Once again Meems you have stunned me with your beautiful pictures!! The butterfly pictures made my heart flutter. I can't wait to see them on my lantana. Those are beautiful nurseries. It makes me want to get in the car and go nursery hopping. It's still too early yet. Beside I have a pile of dirt to haul to the back yard. My lunch is over, I best get busy. That sounds like a wonderful outing with your DIL...and how nice that you share a love of gardening! Oh my gosh you are such a lucky MIL to have a DIL that shares your gardening passion. What fond memories you will have building your gardens together, sharing plants and gardening tips and above all SHOPPING together. Wow. I could almost smell the wisteria. Aaaaahhhhhhhh it won't be long now. melanie: Thanks. I wish I were close by - well at least within 300 miles - I'd go with you... can always manage another trip to a garden center. Patient Gardener: Thank you... I"m glad you love my blog. We do have some quality nurseries near my home just not any so chic! Thanks for visiting and welcome to Hoe&Shovel. Robin: Soon you will have butterflies on your lantana. Butterflies never really my garden but the warmer days and sunshine bring them out more readily. These of course were living in butterfly heaven. connie: it is a very special blessing and makes my heart swell to share this love with my DIL. Lisa: I just kept breathing deeply to take in the luscious scent of that wisteria. It isn't often I am around it ... so it mesmerizes me every time. I had a WONDERFUL time with you this weekend! It's so nice to have you trapped for hours on end so I'm able to ply you for all sorts of information and knowledge. I planted the foxglove and phlox, as well as the re-do of the hanging baskets, but am holding off on the hydrangea, weigela, and indian jasmine until this weekend. Everytime I think of them I have a different place in the garden I feel they should go! I've never been to Native Nurseries, but pass it on my way to work every morning. I've always wondered about their selections, we'll definitely add it to our tour next time you're in town. Their website isn't spectacular (http://members.tripod.com/~arguelles/NativeNurseriesNews1.html), but the Spring 2008 Newsletter (found on the website) is quite lengthy and details all their departments. Definitely looks like fun! E: Ha! I was the one that asked you 10 times "what was the name of that plant?" Don't worry I wrote it down now and won't forget it. I do the same thing with deciding where to place things... especially when there are a few options.I haven't placed my finds yet.. had to get some Lime to amend my acidic soil for the Hydrangea. I've read conflicting info on their habits so I'm still thinking it out too. Also got my shipment of bare root purchases yesterday so I spent this morning getting those in the ground. I've got lots of planting to do in the next couple of days... and I thought I was almost done for the spring... too much fun. Thanks again for the super fun day... I will always remember it when my Hydrangea are blooming and my midnight and illustris are bringing me great joy. Glad we have another nursery to check out but I will definitely want to go back to Tally Nurseries again. 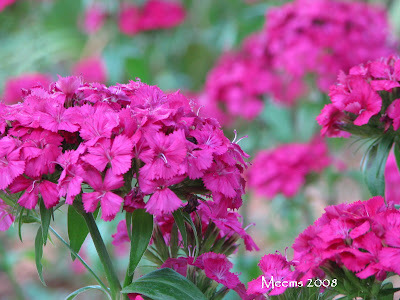 Send me photos when you plant your weigela... it is so YOU. Helping other people spend money at nurseries is one of my favorite things to do, Meems - you really had fun! Too bad my DIL's are so far - either 1200 miles away or 2000 miles. But I can hope! What a perfectly wonderful outing! There's nothing like a shared love of gardening to grow a relationship between a MIL and DIL :) Lucky you! Good luck with all your lovely new plants. I can feel how happy you were from your words and from your delightful photos. kerri: You are right about the connection the shared love of gardening creates. I have had a load of fun this week getting all my new purchases in the ground. 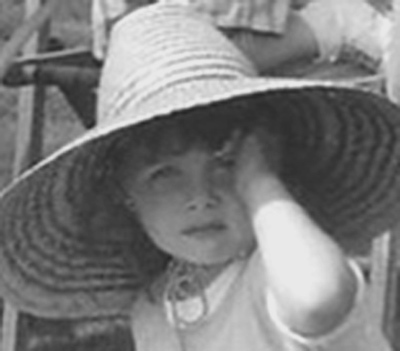 trudi: It was a happy day and now happy memories.